We Want Stuff is a fun dynamic game where people must bid with dice for different items. Every player has a different hidden object that he or she must complete. 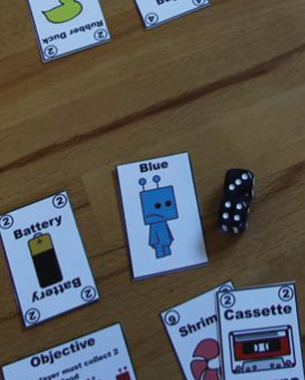 Every card has a value printed on it, this value determines how much you must roll to win the card. There are cards that require more than one die to complete or you just have more chance with more dice. But beware other players try to stop you and you also must work together to not lose all the necessary power required to not lose a round. The player with the most completed objectives wins the game. Ever wondered how pinball played in the form of a card game? Pinball The Card Game is a strategy card game where four players play against each other to become the ultimate pinball master. 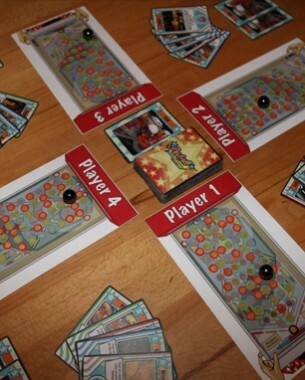 Players use cards to earn points and control the ball on the playfield. They only have two balls and when they lose both, it’s game over! You can win in two different ways: Be the first to earn 40 points or be the last who’s not game over.